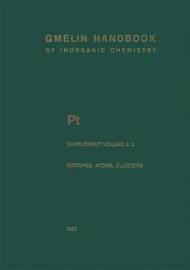 This volume describes the isotopes, atoms, atomic ions, molecules, and clusters of the six platinum group elements Ru, Rh, Pd, Os, Ir, and Pt. 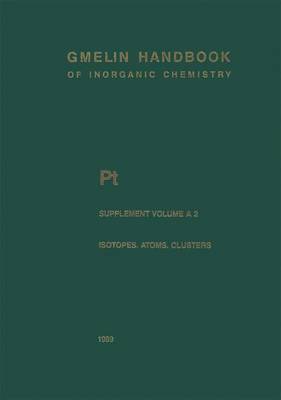 It starts with a compilation of the properties of the isotopes, followed by the description of the formation and separation of the radioactive isotopes. The chapters on the atoms and atomic ions deal with the configuration of the outer-shell electrons, manifested by optical terms and spectra, ionization energy, and electron affinity, as weil as with the energy levels of the inner-shell electrons, manifested by X-ray spectra and Auger electron spectra. The last section gives information on the formation and the physical properties of the plati- num group molecules and clusters. Most of the contributions are written by extern al experts (for details, see the back of the titte page). One of the authors (Prof. Y. Cauchois) thanks Dr. M. Othmane for his constant and efficient cooperation in the treatment of the drafts and the checking of the proofs. Frankfurt am Main, January 1989 Dieter Koschel XI Table 0' Contents Page 1 Ru, Rh, Pd, Os, Ir, and Pt Isotopes 1.1 Introductory Remarks . . . . .
7 Illustrations, color; 4 Illustrations, black and white; XIII, 353 p. 11 illus., 7 illus. in color.